A US$200M plant to cater for the drilling activities of ExxonMobil and the Liza1 activities is revving up to start operations at Houston, East Bank Demerara. It would rate as one of the largest investments for services in relation to the ongoing oil activities. The changing face of the former Gafoors Mall location at Houston, with the Schlumberger tanks near the Demerara River. ExxonMobil and its partners have announced that production of oil in its offshore Stabroek block, where large finds have been made, will be in early 2020. The production will be the first for Guyana. 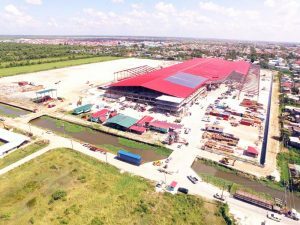 Officials said over the weekend that about US$40M of the investments were spent directly using local labour and services. The Houston, Texas-headquartered Schlumberger Limited purchased a large part of the Gafoors complex, earlier this year, starting work soon after in the wharf area. Schlumberger has a regional office in Trinidad. Over the past few months, the company has been building the facilities, using local contractor, Gaico, and others for the works. During that time, Gafoors, which took the risk more than a decade ago to move out of town to Houston, has been building a mega complex behind McDoom, less than half a mile away. 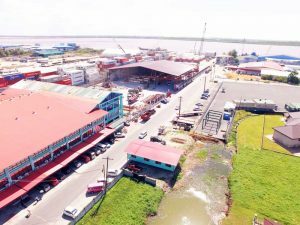 The McDoom location for the hardware giant falls strategically in the area that Government had been planning to land a new Demerara River bridge. The fluids or the special mud are critical to the process of drilling oil and natural gas wells. The main functions of drilling fluids include providing hydrostatic pressure to prevent formation fluids from entering into the well bore, keeping the drill bit cool and clean during drilling, carrying out drill cuttings, and suspending the drill cuttings while drilling is paused and when the drilling assembly is brought in and out of the hole. Schlumberger’s presence in the Houston area will raise the strategic importance of the Houston area. Already, another international service provider, TotalTec, which offers support to the oil and gas industry, is in the Houston area, to the north of Schlumburger. To the south of Schlumberger, is Guyana Shore Base Inc., located in the Muneshwer’s compound. Officials told Kaieteur News that ExxonMobil had been sourcing the drilling fluids from Trinidad for its exploration of several wells. It was the idea that Schlumberger would have taken up the supply from September 1st. It is expected that the Houston complex, with the completed facilities, will be commissioned in a matter of days. The McDoom mega complex of Gafoors.